Composer. Nephew and pupil of Andrea Gabrieli . Court musician in Munich from 1575 or earlier until 1579, then an organist at St. Mark's, Venice, from 1584 until his death. After 1586 his duties included composition. 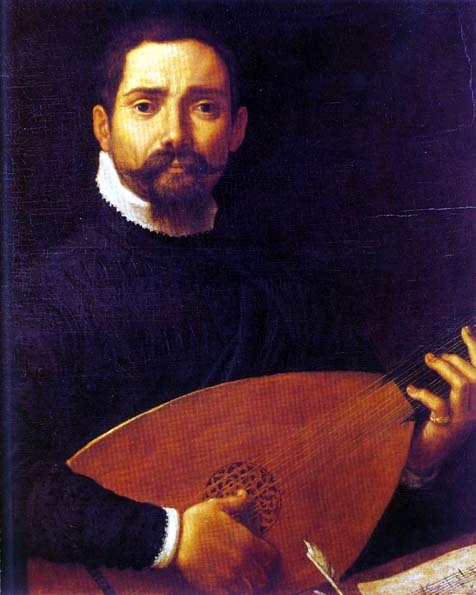 His works are mostly sacred or instrumental, except for a few madrigals and canzonettas written in the 16th century. Of his sacred vocal works all but the earliest are for two or more choirs and reveal a penchant for full, homophonic textures. Even in pieces from before 1600 some parts, especially lower ones, seem to be conceived for instruments, although none is explicitly so designated. His later works show an interest in more modem techniques. Although multiple performing groups are still called for, these tend to differ in nature--choral, soloistic, or instrumental (now frequently marked as such)--and in idiom. Organ (basso continuo) or instrumental ensembles may accompany solo vocal lines. This modernity is clear not only in his own works but also in pieces composed by certain of his students, such as Heinrich Schütz. Among the sacred compositions of Giovanni Gabrieli are a Kyrie, Gloria, Sanctus, and Benedictus, all included in a print of 1597 and presumably belonging to a single Mass. The lower parts of the Kyrie à 5 appear to be instrumental, the highest for a vocal soloist. This part has piano and forte echo effects and coloratura writing that requires a virtuoso performer. Another Benedictus--from Book II of the Sacrae symphoniae of 1615--is for three choirs à 4, consisting of TrebleSST, SATB, and TTTB. At the beginning, these choirs twice follow each other in the order lowest-highest-middle and then gradually build up to a resounding Osanna, in which all twelve voices participate. However magnificent this Benedictus may be, it is nevertheless true that Mass composition was of secondary importance to Giovanni, as it was to most of his Venetian contemporaries. The golden age of the polyphonic Mass, indeed, was drawing to a close. In Giovanni's motets, however, the Venetian style of polychoral composition attained its culmination. Motets of his began to appear in the 1587 volume representing him and Andrea jointly. "Giovanni Gabrieli is the musical Titian of Venice, as Palestrina is the musical Raphael of Rome." With his compositions, however, we have definitely crossed the border into the domain of baroque music. Purely instrumental music is unusually prominent in Gabrieli's output. Of his many works for keyboard solo, the ricercars are the most distinguished. More important, however, are the ensemble pieces, commonly named canzonas or sonatas. The majority of these are for multiple "choirs," with some florid voices for particular instruments, especially violins and cornets. Relatively little of Gabrieli's work was published during his lifetime. The most substantial collection by far is his Sacrae symphoniae of 1597, which contains both motets and instrumental pieces. Much more came out shortly after his death, particularly the Symphoniae sacrae ... fiber secundus and the Canzoni et sonate, both of 1615. This music had little influence in Italy but greatly affected musical developments in Germanic lands.